I have never used a lip stain before but I just kept bumping across them while looking for some product reviews online. 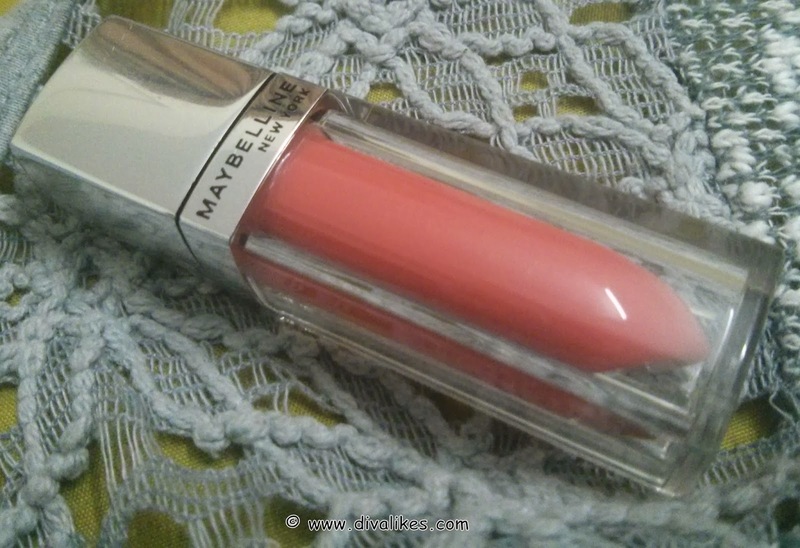 And that is how I got introduced to Maybelline Lip Polish Glam 3. 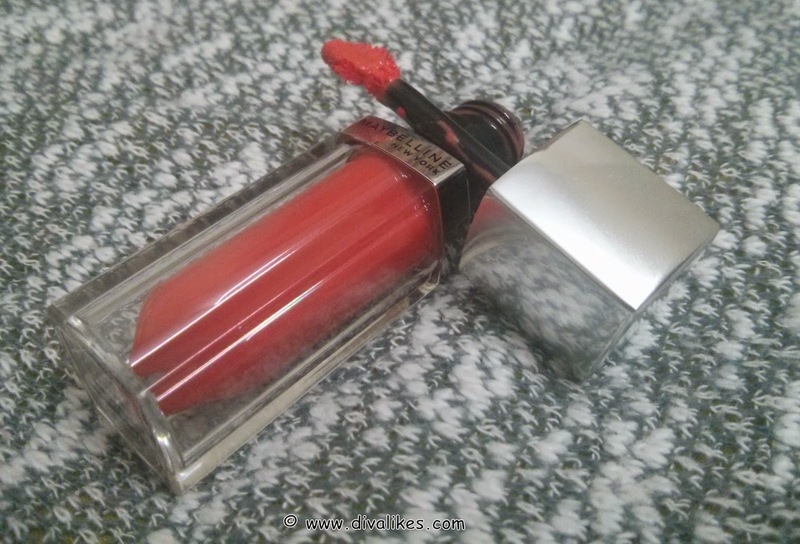 Even though it claims to be a lip polish, it functions more like a lip stain. When I came to know about this product, I wanted to buy it immediately. The first thing I did as soon I got back from work was to go to the nearest store which sold Maybelline products. But to my terrible luck I couldn't get it that day. A few days later I went to the store again and there it was. I was accompained by my mom so I bought just one. But the minute I tried it, I knew I was definitely going to come back for more. 1) Potent Color Extracts: Pure saturated color pigments that provide deep intense color like lipstick. 2) Concentrated Liquid Balm: Moisturizing Liquid Conditioning Balm gets the lips ready for Intensely Rich color. Gives soft Cushiony feel & care to lips. 3) Glossy Shine Serum: Built-in glossy top-coat, that makes lips look fuller & more luscious. Specially designed Leaf-shaped applicator which makes the application quick & precise. Octyldodecyl Neopentanoate, Trimethylsiloxyphenyl Dimethicone, Hydrogenated Polyisobutene, Hydrogenated Styrene/Methyl, Styrene/Indene Copolymer, Hydrogenated Polydecene, Hydrogenated Styrene/Butadiene Copolymer, Bis-Diglyceryl Polyacyladipate-2, Hydrogenated, Castor Oil Isostearate, Bis-Behenyl/Isostearyl/Phytosteryl Dimer Dilinoleyl Dimer Dilinoleate, Cetyl Dimethicone, Silica Silylate, Pentylene Glycol, Poly C10-30 Alkyl Acrylate, Caprylyl Glycol, Pentaerythrityl Tetra-Di-T-Butyl Hydroxyhydrocinnamate, Calcium Sodium Borosilicate, Punica Granatum Seed Oil, Alumina, Calcium Aluminum Borosilicate, Synthetic Fluorphlogopite, Linalool, Silica, Polyethylene Terephthalate, Tin Oxide, Limonene, Aluminum, Hydroxide, Acrylates Copolymer, Dimethicone, Parfum/Fragrance. May Contain: Mica CI 77891 / Titanium Dioxide CI 45410 / Red 28 Lake CI 77491, CI 77492, CI 77499 / Iron Oxides CI 15850 / Red 7 CI 45380 / Red 22 LakeCI 15985 / Yellow 6 LakeCI 19140 / Yellow 5 LakeCI 75470 / Carmine CI 42090 / Blue 1 Lake]. Apply lipcolor with applicator wand starting in the center of your upper lip. Work from the center to the outer edges of your lip, following the contours of your mouth. Then glide across the entire bottom lip. The packaging is a transparent bottle with a silver cap. It looks like a regular lipstick upside down. This also makes it look very elegant and chic. I am a huge fan of corals and oranges. 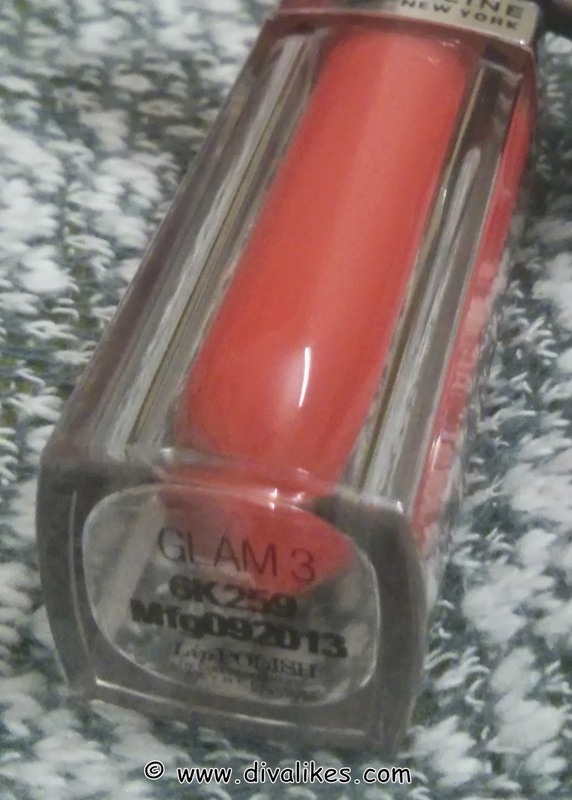 Glam 3 is a hybrid of coral and orange which is what drew me towards the color. Apart from Glam 3 there are 14 other variants which give you a wide palette to choose from. 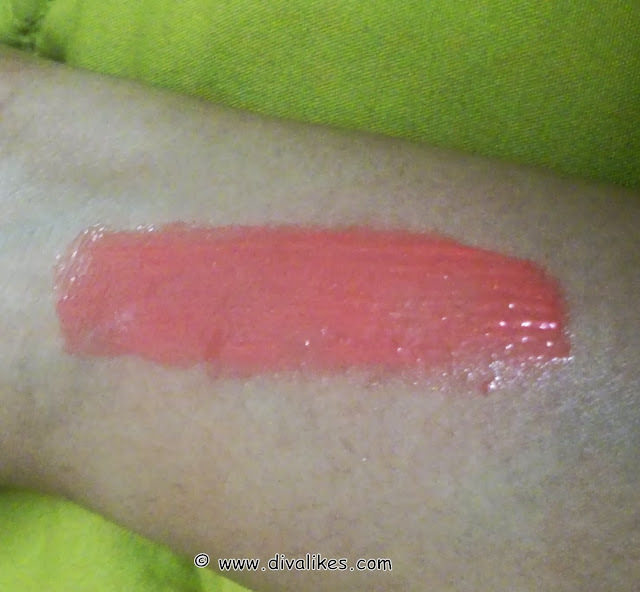 When applied on to the lips it gives a nice color and the gloss keeping the lips moisturized. It provides a rich tone with just one swipe. It can also hide any discoloration of the lips because it is well pigmented. Most importantly it is not sticky. In fact it is quite smooth and nourishing on the lips. The staying power is only 2-3 hours and it does last even after a meal. Though the glossy finish disappears in a few hours, the pinkish stain remains almost throughout the day. I would have liked it better if it had more staying power but then it has not failed to impress me. Like its claim to leaves your lips soft, supple and more conditioned than before, this product does exactly the same. 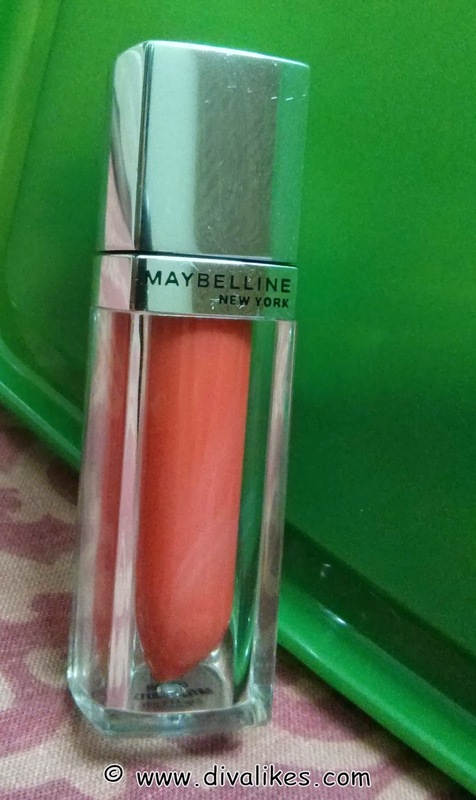 Maybelline Lip Polish Glam 3 is a striking lip color according to me and I would definitely go back to try another shade. Lovely swatch Supraja...nice review. I am yet to try this shade! Thank you so much and please do try it out. You'll love it. I feel same, slightly over-priced! Other wise the shades are brilliant! Thank you Naomi :) and happy women's day to you too! Thanks a lot Lisha :D give it a try, i'm sure it will look amazing on you too.